The tops of these teeth look like melting popsicles. 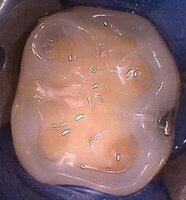 It’s not decay – the enamel has been dissolved away – by acid. 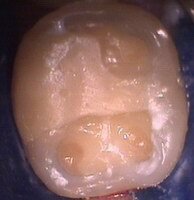 This kind of tooth damage used to be common mainly in people with eating disorders. But the number of patients with significant damage to their tooth enamel is skyrocketting these days. We’re seeing all kinds of people with the enamel on the tops or sides of their teeth perforated or completely dissolved away. The damage can be severe, creating severe wear, and tooth sensitivity that can ultimately require extensive treatment – and thousands of dollars – to repair. Among the chief culprits: diet pop and orange juice. Diet pop? Orange Juice? That’s right. These and similar drinks can do tremendous harm to your teeth. And it’s not the sugar – it’s the acid. A wide variety of snack drinks and food – including many natural juices – have surprisingly low pH (in other words, they’re acidic). Tooth enamel is mostly calcium, and acid will dissolve it the same way descaler solution dissolves the scale in the bottom of your kettle. And it takes surprisingly little acidity – anything with a pH below 5 can do it. Teenagers are the most frequent victims of acid damage because they drink a lot of pop and juices, and tend to sip and swish it in their mouths. And here’s a statistic for you: North American women drink more Diet Coke than water! Frequency. Anyone can have a Coke once in a while without harm – its what you drink habitually that matters. Exposure time. Sipping acidic drinks slowly (or, even worse, swishing it about in your mouth before swallowing) gives it more time to attack your tooth enamel To minimize the effect, drink it quickly and try to keep it off your teeth! There always seems to be someone ready to market any new health trend – just look at all the foods conspicuously labelled “Cholesterol Free”. When we first saw this juice label, we hoped it would really be a better product. 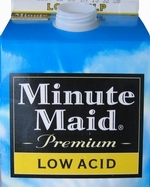 But nowhere on the box did it specify exactly how much “lower in acid” it was. We wrote the company asking for details and ….. they didn’t answer. If we ever do get the figures, we’ll post it, but in the mean time it looks like just marketing hype.